And so it was that I was able to finally successfully tie the knot (see right). It still needs work, of course, I've tightened it up too tightly and this particular knot clearly needs room to breathe. So, I will need to either tie it again and tighten more gently this time or execute the more difficult (but less mindful) task of adding slack back into a knot. Right now the hole in the middle is smaller than I would like, and the properly tightened version may still suffer that fault. One more try and then I will decide between the basic hexagonal with less overlap or the type 2. 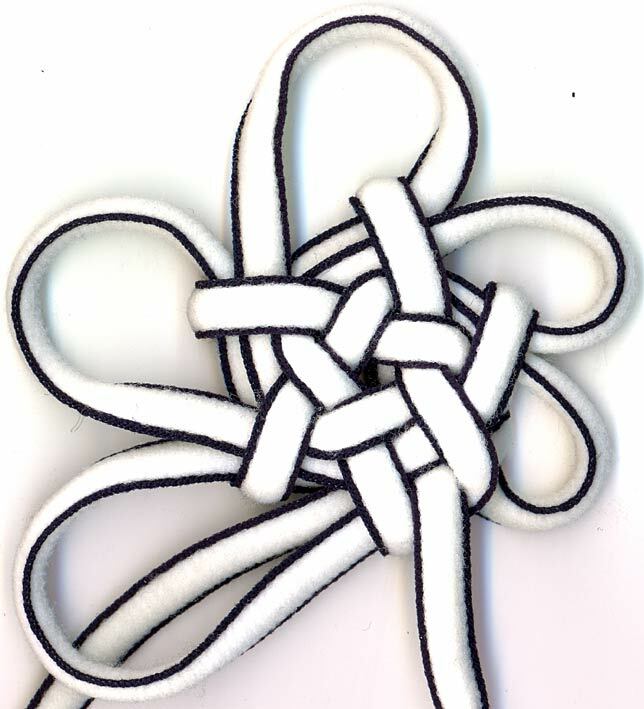 For my History of Fiber class I'd really like to do research into Chinese knotting. Problem is, I'm having a hard time finding good sources of information on the history of Chinese knotting. Do you know of good places to look? If you could please e-mail me that would be very beneficial. The best text to start with would be The Complete Book of Chinese Knotting: A Compendium of Techniques and Variations by Lydia Chen. It's a book that's still in print and available from most booksellers, and a reasonable library in a place with any significant Chinese population would probably have it as well. My online bibliography (http://www.chineseknotting.org/book/) has many of my books, although I haven't maintained it properly for the last number of years. If you can read Chinese, you'll probably find lots of information that I don't have. I don't know what perspective you are seeking, however I did write an article in the latest Knot Heads World Wide eZine (http://khww.net/ezine/KHWW-Issue-1.pdf) about knot artisans in Imperial China. I agree that Lydia Chen's books are a good start to learn about the history but also the techniques of Chinese Knotting. I have Lydia Chen's book titled "Chinese Knotting Creative Designs that are Easy and Fun" and find it invaluable from a practical point of view as the instructions are simple and easy to follow. Another book that you may be interested in is Suzen Millodot's "Chinese Knots for Beaded Jewellery". Suzen's book, however, focuses on technique rather than the history of the art. 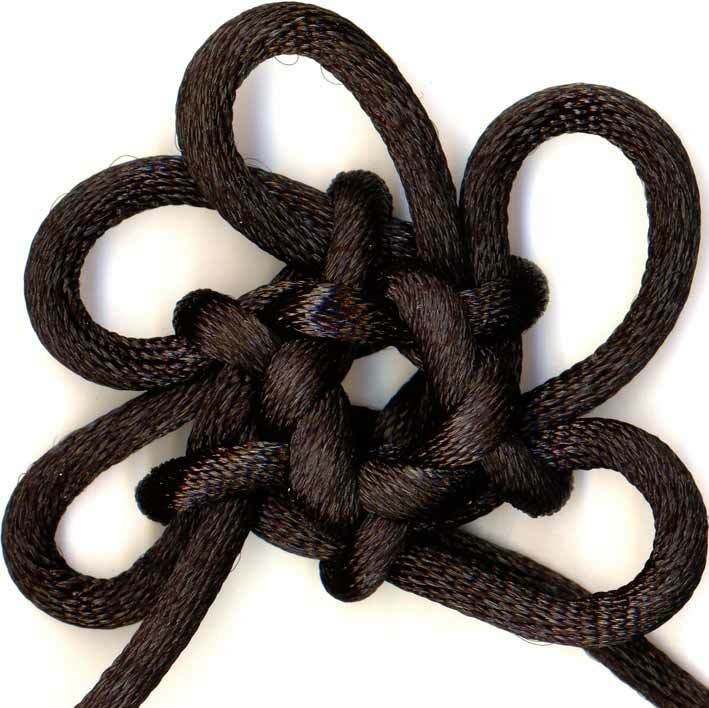 I'm currently learning and experimenting with Chinese Knots in Hong Kong so if you would like to visit my blog http://dumplingdesignz.blogspot.com there may be something there that interests you. If however, you are only interested in the history of the art and not the technique then I'm sorry my site would not be suitable. What a fantastic knot! What could you use it for? Or is it purely decorative? Decorative knots, while aesthetically interesting on their own, are still useful for button frogs, as jewelry (pins, earrings, pendants, etc). There are many home decorating uses for knots such as pillows, curtain tie backs, light pulls, even coasters and napkin rings, etc, etc.